So you and your partner have decided that you want no more children and you are prepared to undergo a vasectomy? There are numerous reasons why a man chooses to even consider this procedure - more often than not it is a selfless act of consideration for his partner, however there can be many other reasons too. Most men don't relish the idea of undergoing the vasectomy procedure - many go through with it with dread and suffer the consequences - (the after effects don't actually last that long but it may become imprinted on a man's mind) - something not to be forgotten. Just a few years ago a man made international news about being the first person to undergo a vasectomy using hypnosis - not only that, but his recovery was far faster than others using the normal procedure - and the surgery took only 4 minutes compared to the normal half an hour. 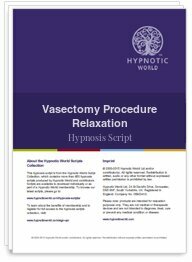 This Vasectomy Procedure hypnosis script from Hypnotic World can help your clients to gain control in every way. You can assist your client and use time distortion (suggestions included in the script) - plus the wonderful way of helping them to experience no pain at all.